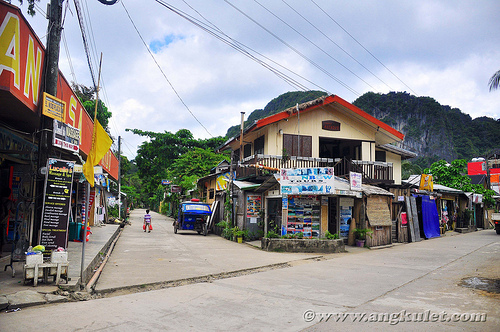 El Nido is a great place to meet other travelers and has a few really cool places to eat and drink. In fact, I spent my 48th birthday at the best pizza place in El Nido, Altrove, with some incredibly cool people I met on an Island Hopping Tour. Brilliant! 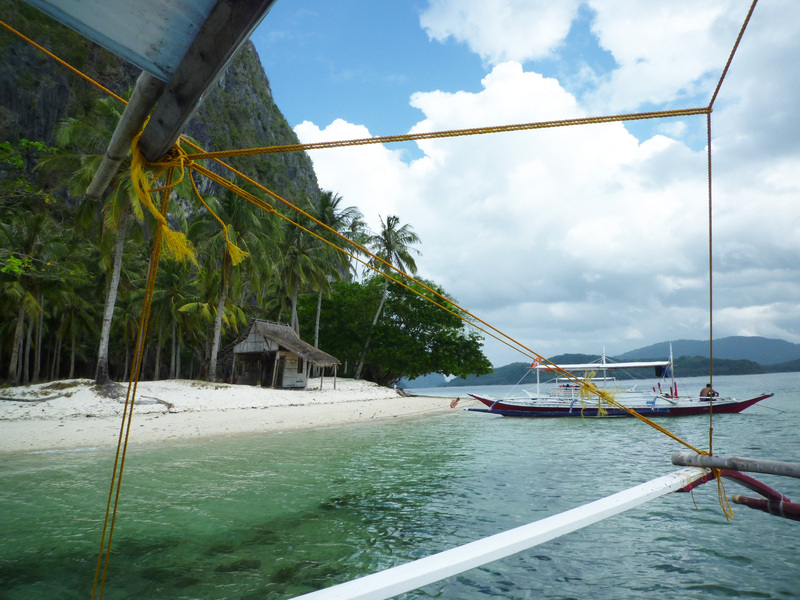 Another reason to go beyond Puerto Princesa and find your way up to El Nido. It was an amazing dinner and an amazing post-dinner beers-around-El-Nido session. CHEERS! We had all been laughing and joking all day as we hopped from beautiful beach to beach, exploring cave after cave, so I felt quite comfortable telling them as we approached El Nido, “Actually, it’s my birthday today.” I told them of a pizza place I’d heard about and that I planned to find for my birthday dinner. “Everybody has to eat, so why don’t you join me for some good pizza and help me celebrate my birthday?” And so we decided to meet up for a few beers by the beach before moving to the restaurant. I was geeked! I was the first to make it to the beach bar, watching some home-made speed boats do their thing in the bay in front of El Nido. I spotted Marie and Amalie who had the most amazing birthday gifts in hand…a single piece of chocolate cake and two San Mig beers, complete with self-styled ribbons. I was speechless. Check out the most awesome and “lækker” piece of cake I ever remember eating. And just so you can see what the bay looks like behind us, here’s a darkened version of the photo. Not a bad place to be having a birthday beer with friends! 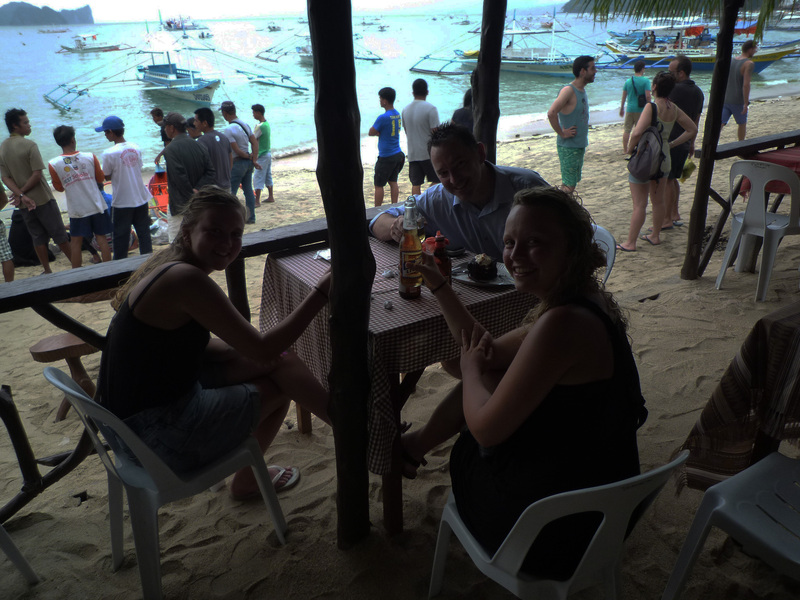 When you eventually get to El Nido, there aren’t too many restaurants to choose from. So choose Altrove. When facing El Nido with the water at your back, it’s located on the left side of the town on the road that runs behind the beach bars and hotels. Walking up the road, it will be on your right. Sorry for the imprecise directions, but I was half-cut by the time I left so things are a bit fuzzy. What can I say, it was my birthday. In any case, it’s easy to find. You’ll see the wood-fired oven on the first floor and steps leading up to the restaurant. Leave your shoes on the steps on the way up. It’s not the cheapest place in town, but the food was great. And Alan, you dawg!! Thanks again for sneakin’ up when I wasn’t looking and paying for our dinner! I truly appreciated it! From my great birthday cake on the beach to an amazing dinner at Altrove — the four of you made my birthday unforgettable. Thanks! Here are some photos of Altrove I found on angkulet.com. Been to Altrove? 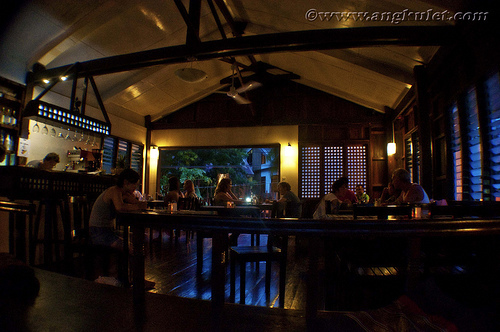 Or know some place better to eat in El Nido? Let me know! Happy birthday Mike! Hope to see you when we come visit Tokyo in December! Thanks! And when in December? I’ll likely zip over to Boracay over the X-mas break. Thanks for the birthday wishes. And yes, Palawan is definitely worth checking out. My next post will probably be an overview of the 3 main destinations, followed by a few detailed posts. Hope all is going well with you and your studies! I keep stalling on writing that “Places to Eat in El Nido” because I know all the owners hahaha and I’m scared of writing a review. I should though, even just a list? Oh my god, I’m scared just thinking about writing it. Well, as long as you’re not too brutal, it will be OK 🙂 I liked the food at the Art Cafe — seems like a fun place at night. I loved the live music at that Reggae live music house kind of in the street behind Art. And I hear the food at La Solangane is great, although I didn’t eat there (that’s where I was staying). Anyway, ping me when you write that list up so I can check it out. Where do you actually live, anyway? El Nido? I’ve never heard of being “geeked” lol. What does that mean? Really? I thought “geeked” was from all over Canada. Must have been a west coast thing…3 decades ago. lol Anyway, it means happy or excited about something. El Nido sounds like a great place, especially after a few weeks off the beaten track, so one can stock up on the taste of pizza and companion of other travellers. Thanks, Cez. I appreciate it! And yes, El Nido is a great place to check out. It’s a bit of a trek to get there, and the town itself is not that great. But it’s worth seeing while it’s still mostly a backpacker,non-mainstream place. Hello Mike, thank you for celebrating your birthday in Altrove and we highly appreciated your postEd… Hope to see you!